Kiki Smith speaking at Syracuse University Feb. 15. Kiki Smith, one of the most engaged artists of her generation, tackled themes dealing with the representation of the female body and the AIDS epidemic, originally wanted to be an artist that made items to sell at Macy’s. With five Venice Biennales and a mention in “TIME 100: The People Who Shape Our World” under her belt, it is safe to say that Smith’s influence has extended outside of her dream of a department store, which she eventually rejected. Kiki Smith is currently being featured in a solo exhibition, Kiki Smith and Paper: The Body, the Muse, and the Spirit, showcasing an array of the artist’s drawings and prints at the Syracuse University Art Galleries. The exhibition started January 18, 2018, and will run through March 9, 2018. Kiki Smith and Paper: The Body, the Muse, and the Spirit specifically highlights the artist’s obsession with the idea of the female form through different realms — spiritually, fictionally, physically, etc. — depicted on her favorite medium: paper. Smith spoke at Shemin Auditorium Feb. 15, not specifically about the exhibition, but the beauty of printmaking, attitudes toward creating art, her love of nature and anything else that sparked her mind. “If you see something in your universe, take it,” she said. Smith is a firm believer in the versatility and practicality of printmaking because of its ability to reuse the same image over and over again. For example, when Smith’s mother died, her friends brought her flowers. When those flowers eventually died, Smith brought them to the print shop and made prints of the dried up flowers. She also did this with her dead cat, which is an image she can use again, and push through the boundaries of different printing materials. Smith talked about wanting to create work that is “archival,” which is why she rejected working with film. She initially thought making videos seemed “cool,” but then realized that it becomes dated. Unlike paper, film shows age. The VCR that is collecting dust in your parents’ home has to become digitized, which removes the idea from its intended form. The moving image on a VCR looks different when its converted to a DVD. Unlike film, paper is durable; an image on paper can always be exhibited on that medium. 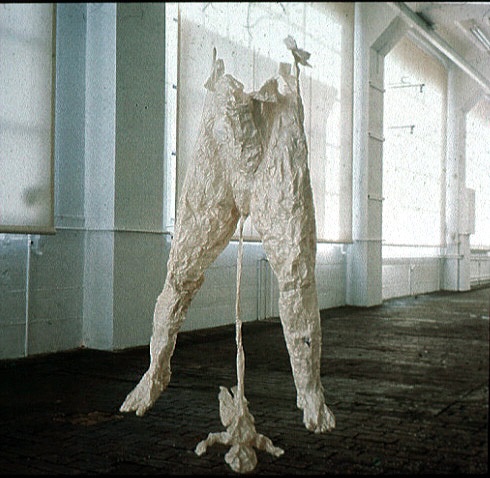 Paper can weather, but even Smith’s “Untitled (paper body with child)” from 1988, a figurative work of a fragmented female body, probably looks as wrinkled as it did when first exhibited. The body is cut from the waist, and a fetus is hanging from the bottom. Although the body is frozen in space, the crinkled texture of the paper creates a dynamic flow of the child being pushed out. Smith’s dedication to creating works that can stand the test of time led her to “destroying one of her best pieces,” she said. She didn’t give much insight into the aesthetics of the work, but she said that she was worried the piece would deteriorate over time. Smith went on to say that she feared that she would sell the artwork to a gallery and an unsatisfied customer would come back banging on her door to complain that the work was falling apart. "If you see something in your universe, take it"
In an age where the intersection of the arts and commerce is hotly contested, Smith said that she enjoys transforming her work into blankets or scarves that can be worn by anyone. “I like merchandise and how things can live in different forms, like when making jewelry,” she said. Smith looks at working with fibers as just another way to engage with different materials and see her images differently. Art, in Smith’s mind, cannot “be so personal and so egocentric” that people feel isolated from the piece, but it can’t be so generic “that you have no personal stake in it.” As a closing note, this sentiment speaks to the success of Smith’s ability to remain active and relevant. No matter how personal her art is–i.e. the piece of her dead cat–Smith is able to connect through those feelings of grief or loss and produce something beautiful. The universal feature of those emotions is heavily emphasized through her favorite medium — paper. “Kiki Smith and Paper: The Body, the Muse, and the Spirit” is on view until March 9. Admission is free.